Buon giorno and welcome to Stefano’s RomeCabs Transfer and Tours blog. 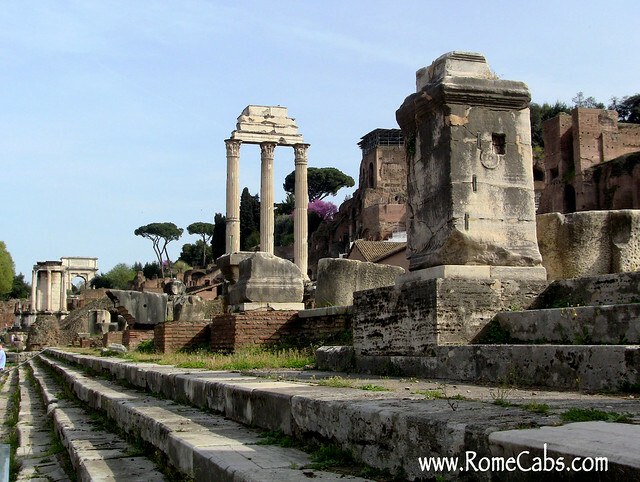 The Roman Forum is one of the most well recognized ancient Roman ruins located near the Coliseum. For centuries the Roman forum was the center of ancient Roman public life. It was the political, judicial, religious, and commercial center of the Roman empire. Located in the small valley between Capitoline Hill and Palatine Hill the Roman forum has been the most famous meeting place in all of the world and throughout history. It still gathers people even today with about 4.5 million visitors each year. Originally the area of the Roman forum used to be a marshy late into which waters from the surrounding hills drained into. This made it unlivable. Eventually the valley was drained by the Etruscan king Tarquins with the Cloaca Maxima: one of the world’s earliest sewage systems that can still be seen today in existence inside the Roman Forum. With the marshy water emptied into the Tiber River, this valley became livable and people began to settle and build. Scattered ruins of temples and buildings give visitors a glimpse of what the Roman form was like doing the glory days of the Roman empire. The Roman forum developed over time as it grew in importance and in architecture filling the form with large public buildings and temples the dramatically reduced the open area where people can gather. You can enjoy the remains of the once impressive Temples of Castor and Pollux, Saturn, Vesta, Antonius and Fausta, Caesar, Romulus and more. Triumphal arches in the Roman Forum are the Arch of Titus and Arch of Septimus Severus. Basilicas of Ancient Rome include Maxentius and Constantine, Julia and Aemilia. Basilicas of Ancient Rome are not to be confused with the Christian basilicas of today. In Ancient Rome, basilicas were the Town Halls of Roman life. The current basilicas got their names from the architectural plans of the Roman basilicas which they adopted. Thank you very much for choosing Stefano’s RomeCabs for your Transfers and Tours in Rome and beyond. We look forward to showing you beautiful places in Italy!